Burn efficiently with a Stovax woodburner this cold weekend! 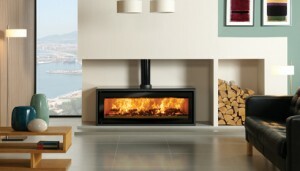 Get cosy this cold weekend with a Stovax Riva woodburner. 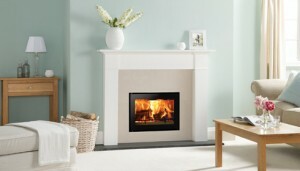 Home » Blog » Posts » News & Updates » Burn efficiently with a Stovax woodburner this cold weekend! If you haven’t yet, then you should…make room in your home for the impressive, highly efficient woodburning stove, the Riva Studio 3 Freestanding. This impressive firebox emits a heat output of up to 11kW and can accept logs measuring up to 500mm (20”) – a very warming thought in light of the heavy snow forecasts this weekend! 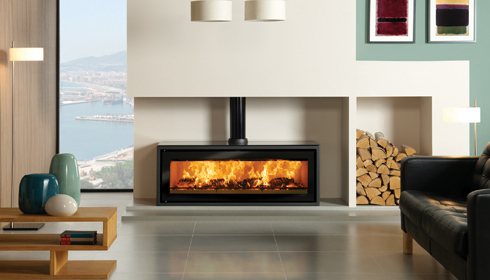 Designed for those eco conscious consumers, the Riva Studio 3 Freestanding integrates a Cleanburn system which means that those lengthy, chunky logs burn with outstanding efficiency, resulting in more heat delivery into the room and less going up the chimney. The Airwash system helps to keep the window clean; providing you and your family with stunning widescreen views of the Riva Studio’s beautiful flames. You will be rewarded with a magnificent focal point in your very own living space! If however, you have minimal space, installing its inset equivalent, the Riva Studio 500 inset presents the perfect solution. Both the Riva Studio Freestanding and inset come with various options to choose from. By arranging an appointment with your local Stovax retailer, they can provide you with information on the size, design and suitability of a Riva Studio in your home.